A planet remarkably similar to Earth and potentially capable of sustaining life has been discovered in a "habitable zone" around a distant sun-like star, U.S. scientists said on Thursday. The planet, which is about 60 percent bigger than Earth, is located about 1,400 light years away in the constellation Cygnus. It was discovered using NASA's Kepler space telescope and circles a star that is similar in size and temperature to the sun. "In my mind, this is the closest thing we have to another planet like the Earth," astronomer Jon Jenkins, with the U.S. space agency's Ames Research Center in Moffett Field, California, told reporters on a conference call. 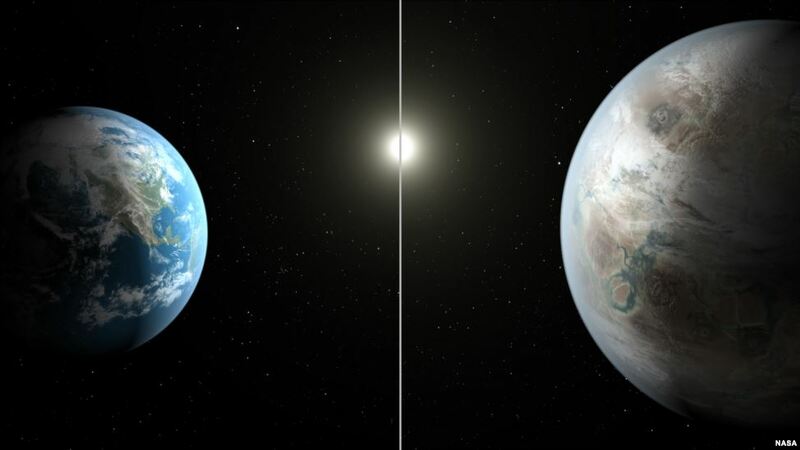 Dubbed Kepler-452b, the planet is positioned about as far from its parent star as Earth is from the sun. At that distance, surface temperatures would be suitable for liquid water, a condition believed to be critical for life. Scientists previously have found Earth-sized planets orbiting in stars' so-called "habitable zones", but those stars are cooler and smaller than the sun. NASA launched the Kepler telescope in 2009 to survey a sampling of nearby stars in an attempt to learn if planets like Earth were common in the galaxy. This is great progress in finding a planet like Earth that is similar in size and temperature around a sun-like star," said Kepler scientist Jeff Coughlin, with the SETI Institute in Mountain View, California. Based on its size, scientists believe Kepler-452b should be rocky, like the Earth, though that theory is based onstatistical analysis and computer modeling, not direct evidence. Kepler-452b's parent star is about six billion years old, compared to the 4.6-billion-year age of the sun. "It's simply awe-inspiring to consider that this planet has spent six billion years in the habitable zone of its star," Jenkins said. "That's considerable time and opportunity for life to arise somewhere on its surface or in its oceans should all the necessary ingredients and conditions for life exist on this planet," he added. With the discovery of Kepler-452b, the telescope has found 1,030 confirmed planets and identified nearly 5,000 candidate planets. The list of potential planets includes 11 other near-Earth twins, seven of which circle sun-like stars. Attempts to learn if Kepler-452b has an atmosphere likely will have to wait for a new generation of more sensitive space telescopes, said NASA's associate administrator John Grunsfeld.